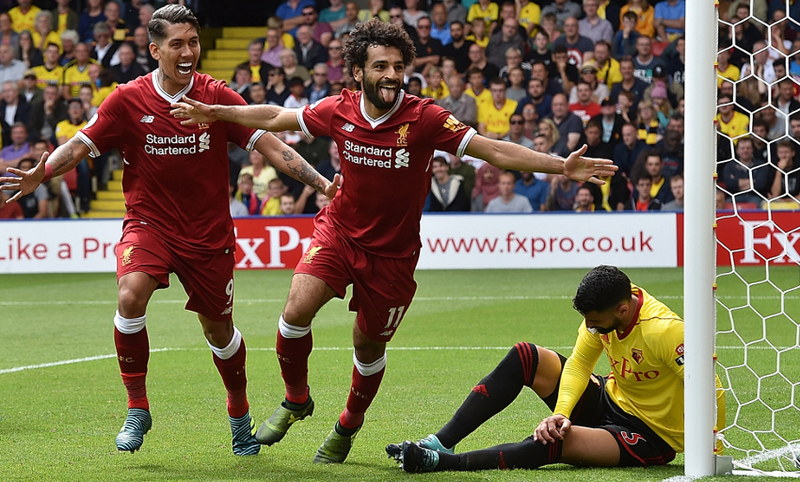 Follow all the build-up, action and reaction from Vicarage Road as Liverpool take on Watford in the Premier League. Today's clean sheet means this side has made Liverpool history - never before have the Reds conceded as few as five goals after 13 league games in a season. Not bad, eh? A game of two halves ends with three points for Liverpool and the extension of their unbeaten Premier League start to 13 matches, courtesy of second-half goals from Salah, Alexander-Arnold and Firmino. Matip comes on for Firmino. Four minutes added on at Vicarage Road. That should really be that for the 10 men. Robertson superbly leads a Liverpool breakaway and though his tee-up for Mane is saved by Foster, it lands for Firmino to force home right in front of the travelling fans. 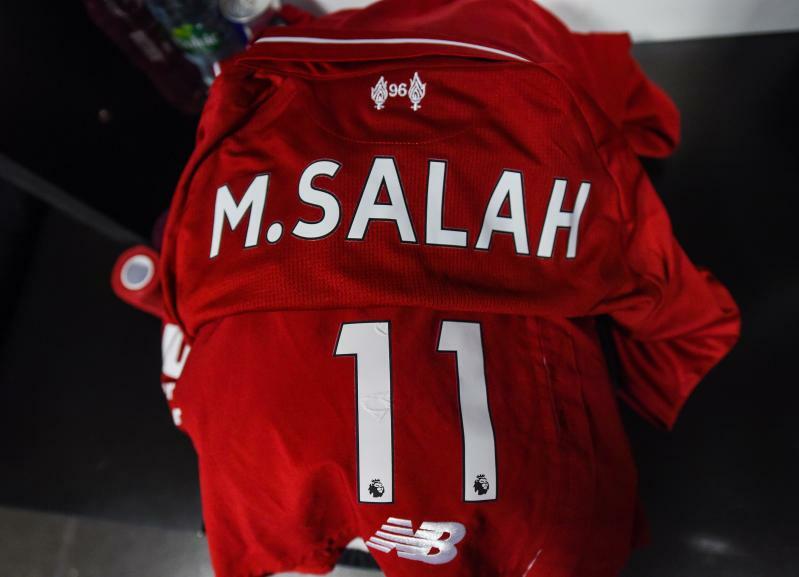 Fabinho replaces Salah for Liverpool. Henderson is shown a second yellow and a red for blocking Etienne Capoue on the counter. 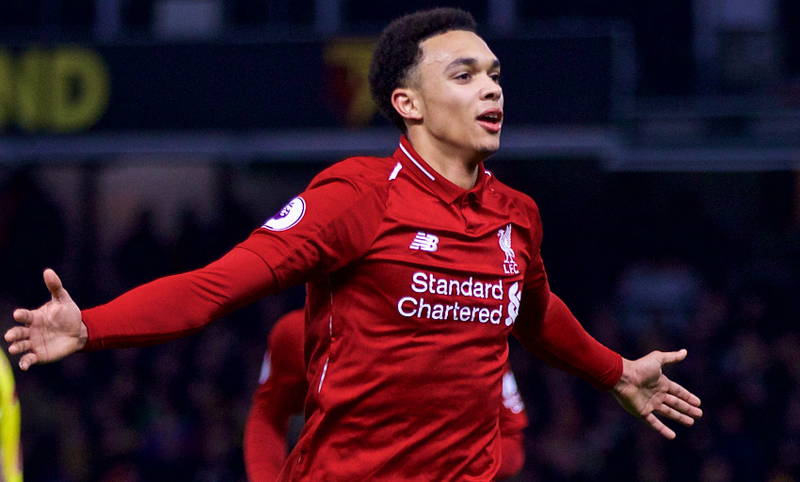 Alexander-Arnold takes control of promising free-kick situation 25 yards from goal and smacks a curling hit into the top right corner for a crucial second for Liverpool. Watford send on Andre Gray for Hughes. 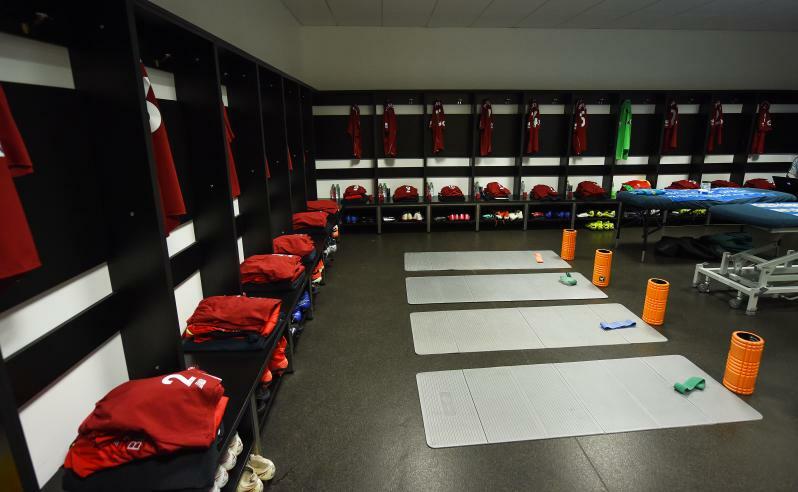 First Liverpool change - James Milner on for Shaqiri. A sweet move from the Reds sees Firmino knock a pass into Mane on the left edge of the area and the forward cuts the ball into the middle for Salah, whose low shot squirms through Foster. 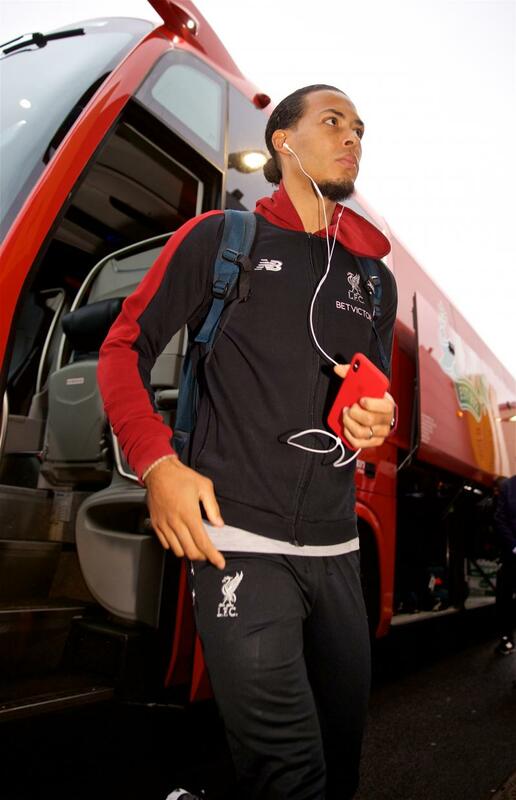 Alexander-Arnold drives a pass to the left side of the box from a cleared corner and Dejan Lovren neatly spins around his marker and clips the ball to the back post - where Firmino can't connect properly with his finish. Henderson booked for stopping Success' attempt at a quick counter-attack. Watford introduce Isaac Success for Deulofeu. Big claims for a penalty as Robertson sticks out a leg and Will Hughes goes to ground after racing towards a loose ball - but the referee instantly rejects the appeals. 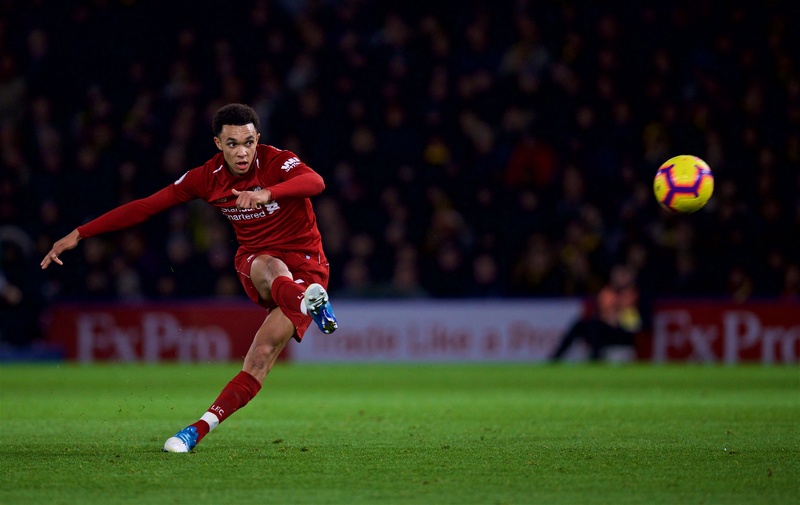 Another glimpse of the Watford goal for Firmino - from Trent Alexander-Arnold's precise cross - but his attempt at an overhead kick from 15 yards out fails. 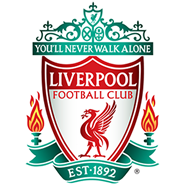 A flowing move by the Reds sees Robertson feed Firmino's central run; he has space to shoot but chooses to pass and Mane's strike from an offside position hits the outside of the left post. Wijnaldum gets the second half under way. Nothing to separate the sides so far at Vicarage Road in a match that started to come to life towards the end of the opening 45 minutes. Shaqiri swerves another excellent pass into the run of Sadio Mane in the area - the No.10 controls, holds off his marker and tries an acrobatic volley that is saved by Foster. 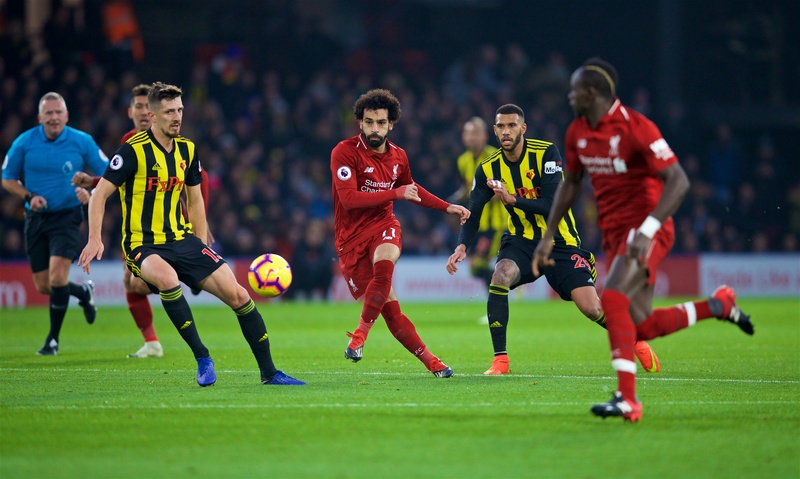 From the corner, Shaqiri picks out Salah, running in at the far post, and the Egyptian's header is stopped by the Watford 'keeper down low to his right. And then chances at both ends! First, Firmino intercepts deep in Watford territory and sends a low strike too close to Foster, diving to his right, and then Deulofeu sets up Pereyra inside the Liverpool box and Alisson has to claw away his angled hit. It's just not quite working for either side in an attacking sense so far. Shaqiri picks out an unmarked Andy Robertson with a smartly-timed cross-field pass but the Scot's delivery is misjudged and loops wide of the far post. Extended stoppage here as Kiko Femenia receives treatment after being clattered inside his own area. He's fine to continue, though. This time Shaqiri curls in a free-kick from the right channel but Georginio Wijnaldum can't quite connect when it reaches the six-yard box. 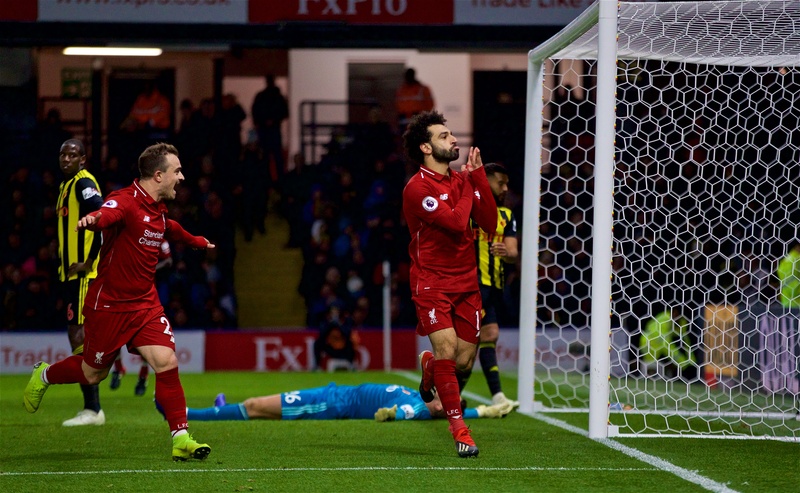 Shaqiri clips a diagonal cross from right to left that looks like it will beat the reach of Foster and present Salah with an open goal - only for the Hornets stopper to get fingertips on it at the expense of a corner. A lengthy rendition of the Van Dijk song emanates from the away end, where the Liverpool fans are in fine voice as usual. On the pitch, the game has settled into a slight lull at the moment. A let-off for the visitors. A defensive error almost allows Deulofeu a one-on-one but the Reds eventually snuff out the threat with the help of Virgil van Dijk. A first early threat from Liverpool as Shaqiri seeks to find a pass through a wall of Watford defenders towards the front three. Eventually he aims for Firmino but Foster is off his line quickly to collect the ball ahead of the Brazilian. Deulofeu latches onto a flick in behind the Liverpool defence and sends a finish past the reach of Alisson Becker and in - but the linesman's flag cuts short Watford celebrations. 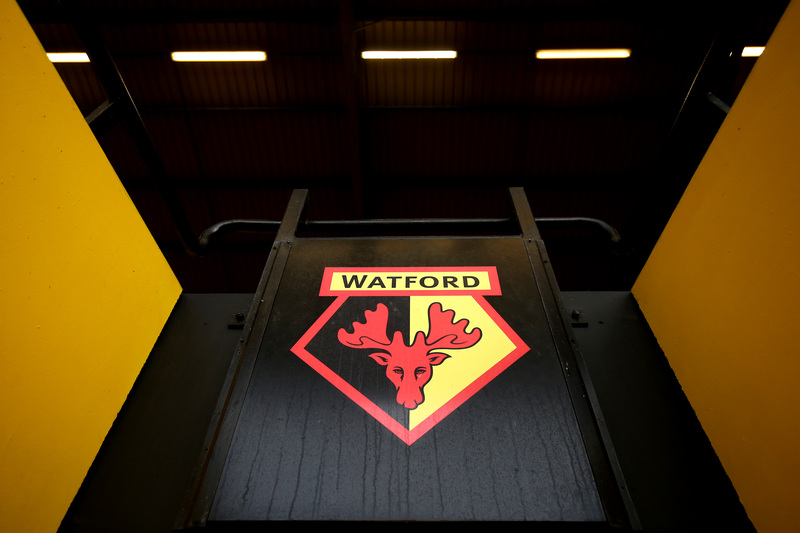 And we're under way - Deulofeu kicks off for Watford. 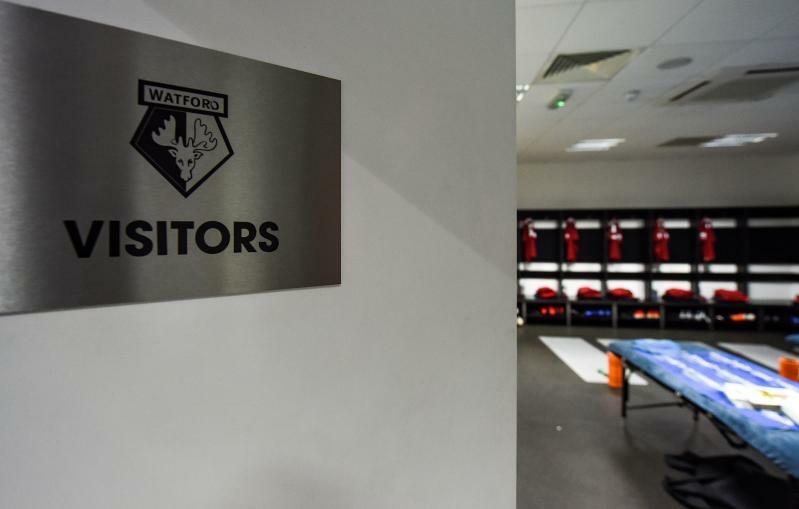 The two teams are emerging from the tunnel at Vicarage Road and we're mere moments away from kick-off now. There's a nice atmosphere building inside the ground, too. The manager has explained how Jordan Henderson has made a rapid return to full fitness to feature at Vicarage Road this afternoon. “[It’s important] of course,” he said, when asked about having the captain back in the XI. “Having them all back is important. 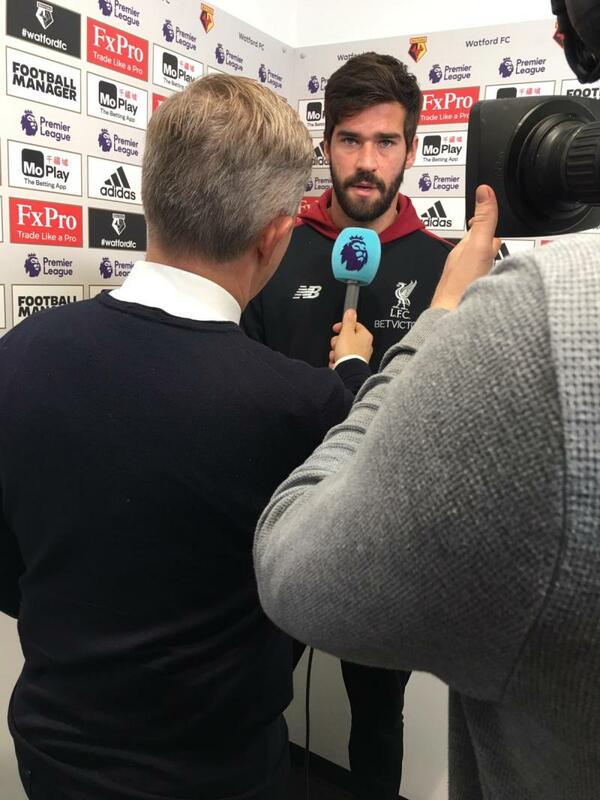 ...to take the pre-match media duties. 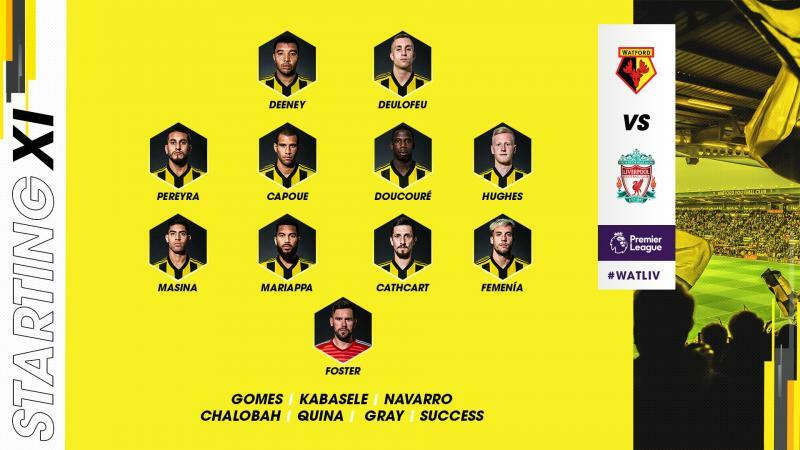 Here is how Watford are lining up today. 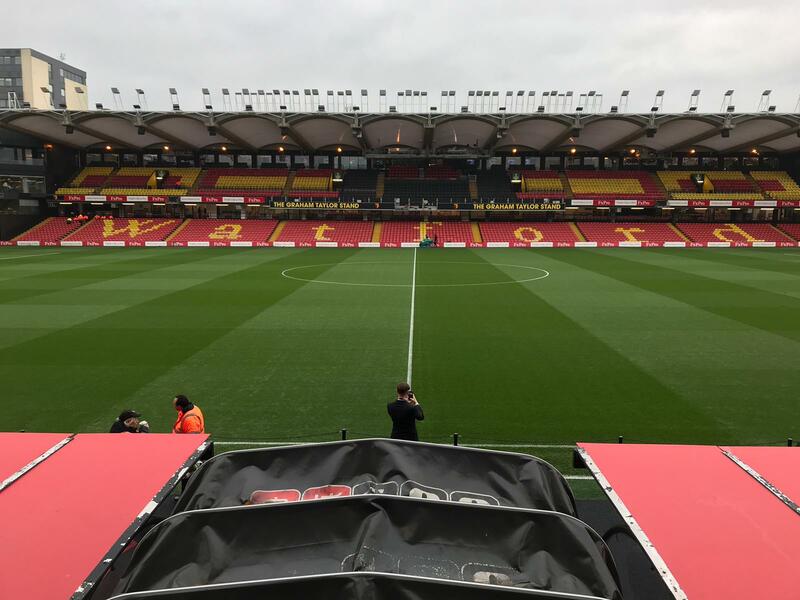 On Joe Gomez, he has travelled to Vicarage Road with the squad today. 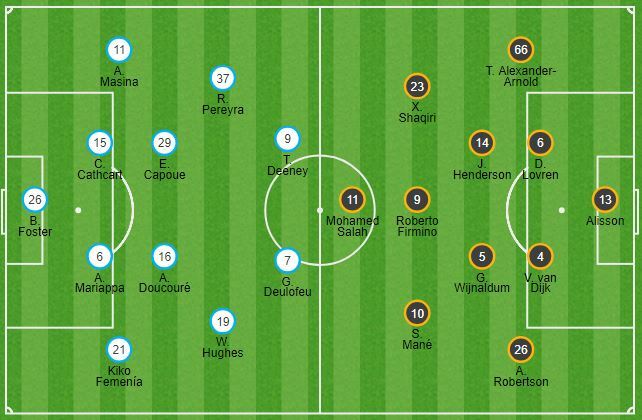 Liverpool make two changes at Vicarage Road as Jordan Henderson and Dejan Lovren start. Joe Gomez misses out after picking up a kick to the ankle in training, but the injury isn’t serious. 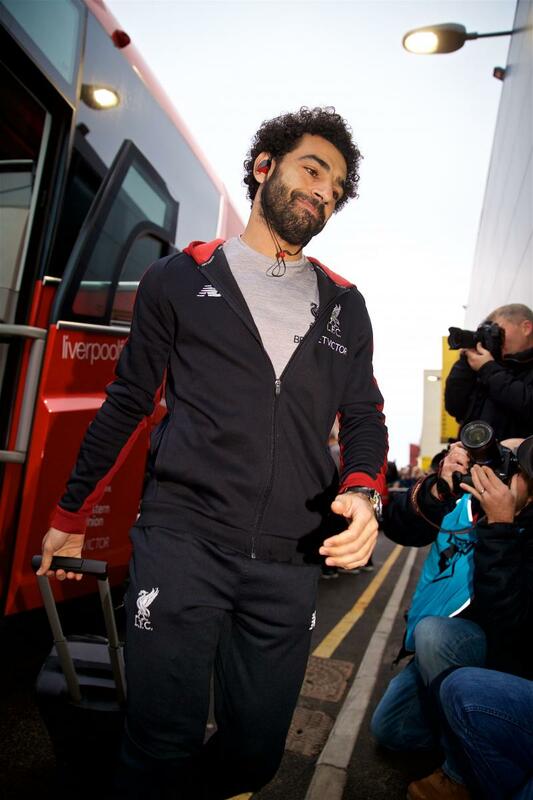 Liverpool: Alisson, Alexander-Arnold, Lovren, Van Dijk, Robertson, Henderson, Wijnaldum, Shaqiri, Mane, Salah, Firmino. 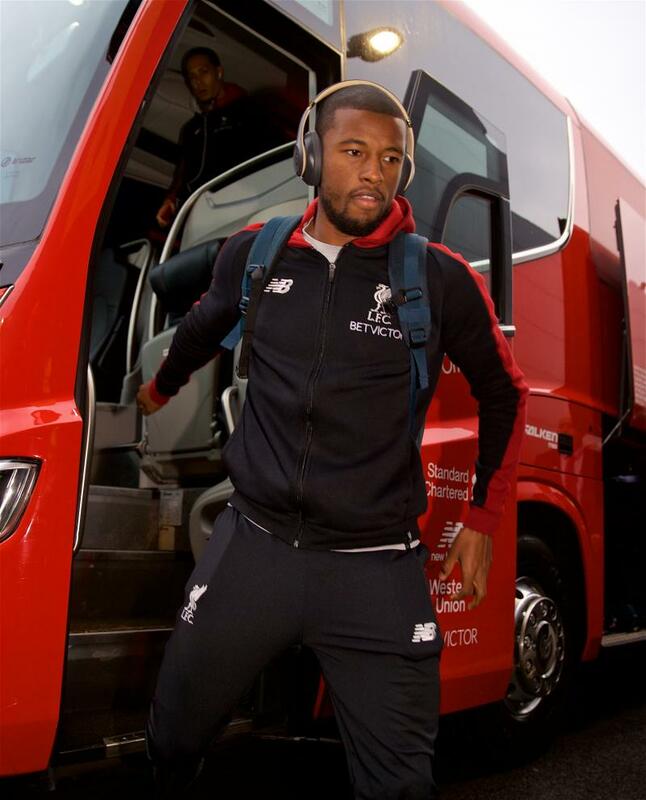 Subs: Mignolet, Clyne, Fabinho, Milner, Keita, Sturridge, Matip. Sadio Mane was on target in this fixture as the sides played out a 3-3 draw on the opening day last season - and the No.10 committed his future to the club earlier this week by agreeing terms on a new deal. 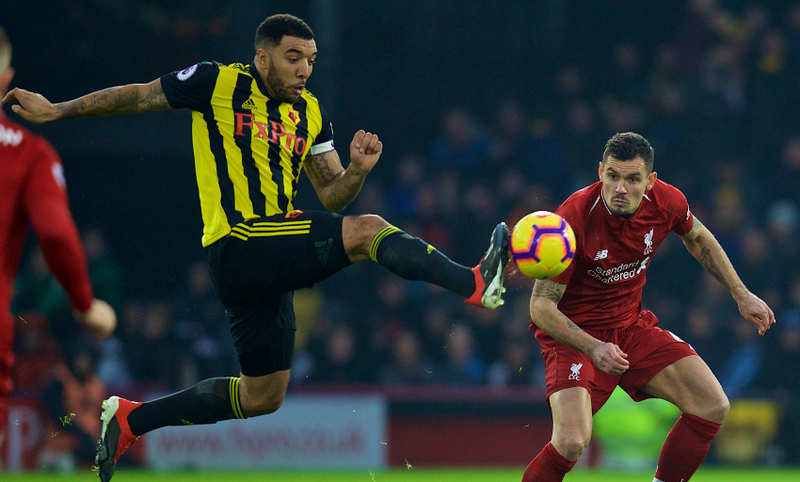 Watford skipper Troy Deeney says his team can't afford to be tentative against the Reds. 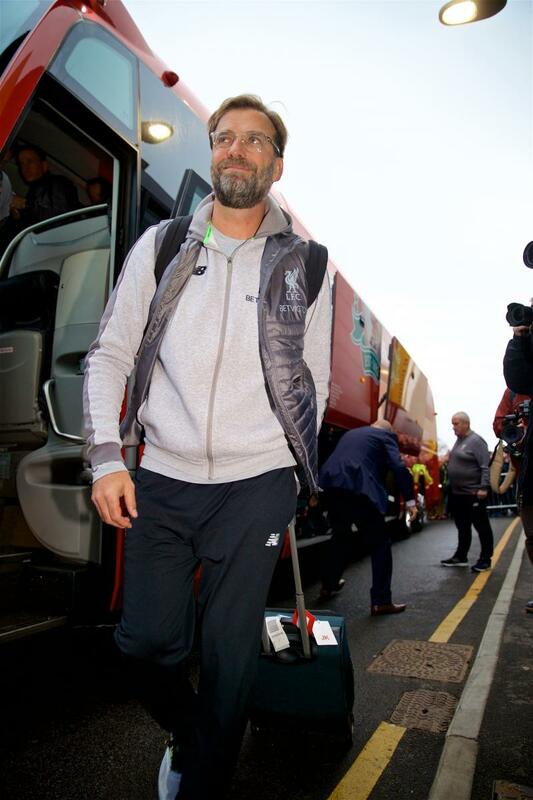 He wrote in his programme notes: "So it's Liverpool today and you don't need me to tell you what a team they are. The league table and the stats say it all, and we know each and every one of us will need to be at the top of our game to get some points off them. "But we don't fear any team in the division. Spurs and Chelsea have both gone away from here with nothing this year and we believe we can add to that list today." 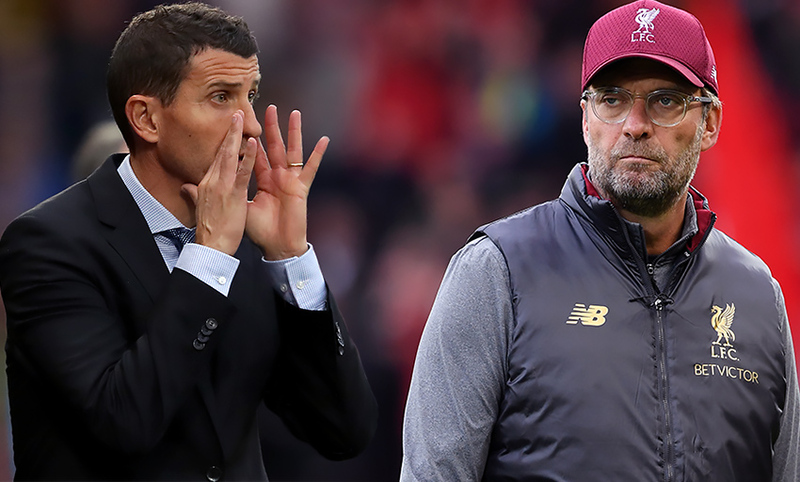 Watford boss Javi Gracia believes his side must be at their very best if they're to take anything from today's encounter with the Reds. He wrote in the official matchday programme: "It is games like today when supporters can be very, very important. We are at home to a very high-quality team in Liverpool and we must make sure the crowd at our home here is involved right from the start. "We know we must be at our best today as we compete against a team that wants to win the Premier League." Click here if you fancy a flutter. "In past seasons I think it's been a really defining period in the season for us," Joe Gomez told Liverpoolfc.com. "So we know how important it is and how tough it's going to be with the amount of games [there are] in a short period of time, but we're ready. All teams in the Premier League face this same task and we've just got to be ready for it and try to get as many points as we can." We'll bring you free live commentary on this afternoon's game here on Liverpoolfc.com. Just click here to access an audio stream that will begin shortly before 3pm GMT. 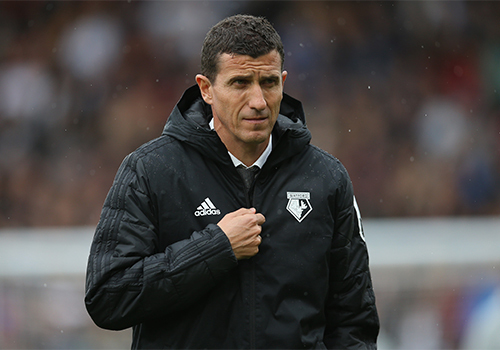 Javi Gracia has guided Watford to their best ever start in the Premier League and he does not intend to alter his team's approach for the visit of the Reds - and believes home advantage could be an influence. "We will not modify our style," he said. "We will be loyal to our style and play the way we usually do, but knowing we have to be careful with their players because they are very, very good. "I expect a difficult game, a tough game. It's a good challenge for us. We are working hard to live this experience and enjoy the games. "Playing at home we feel we are able to win all the games we play. 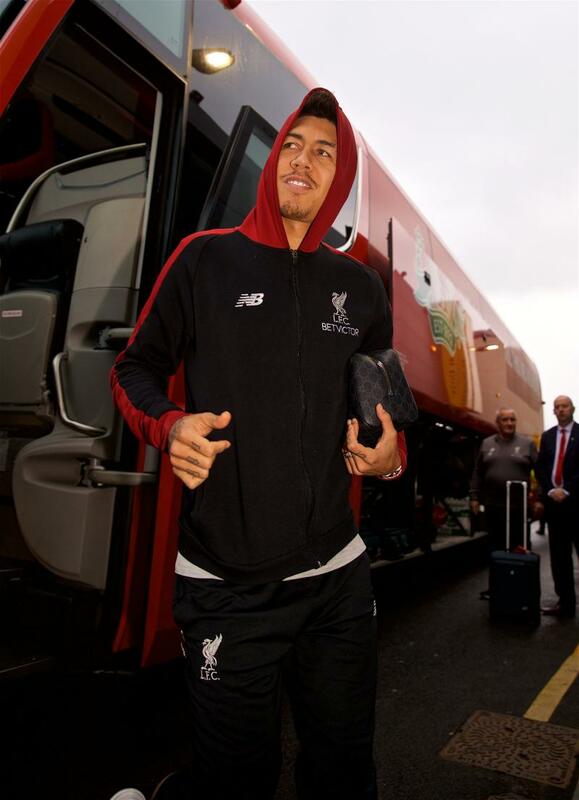 I am sure playing at home with the support of our fans it will be a different game." 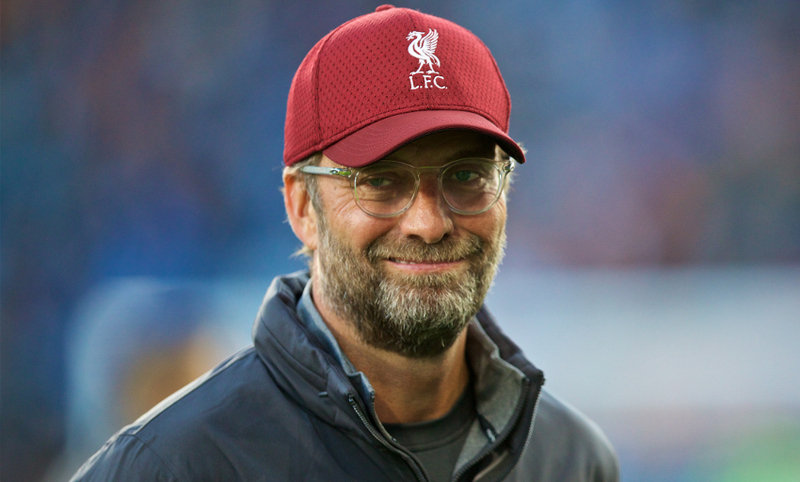 Klopp could record the 300th league win of his managerial career today. The German oversaw 101 at Mainz, 133 with Borussia Dortmund and 65 so far with the Reds. Klopp can call on an almost full-strength squad for this one, though Adam Lallana misses out with a minor injury issue. Jordan Henderson is back in contention, however. "All the rest came back healthy from the internationals, which is brilliant. So, we have to make a few decisions," said the boss. 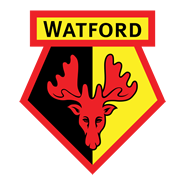 Watford are boosted by the return from suspension of Etienne Capoue, while Will Hughes and Sebastian Prodl are expected to be fit and Adalberto Penaranda is available after receiving a work permit. Tom Cleverley is likely to miss out. The LFCTV GO cameras were at Thursday's training session to capture exclusive footage of the lads in preparation for this game - which subscribers can watch below. Returning from an international hiatus, we present the official Liverpoolfc.com matchday blog weather update™. 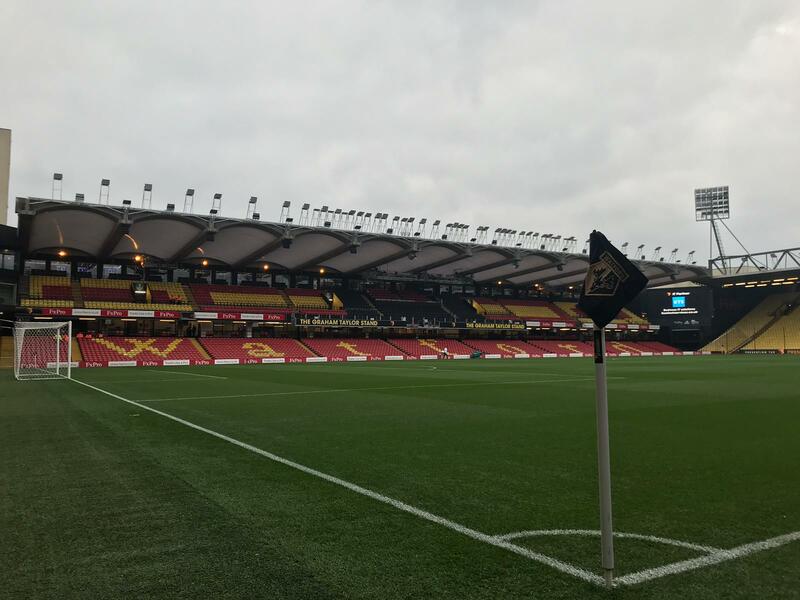 It's an overcast morning in Watford with temperatures currently around eight degrees and not likely to rise by kick-off. In our view, that's coat weather. Hat and gloves optional, as always, if you are heading to Vicarage Road. 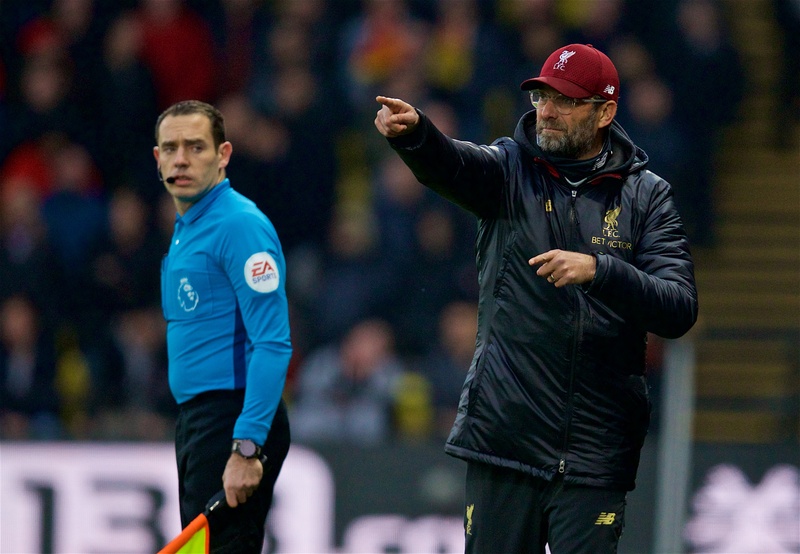 Jürgen Klopp anticipates an intriguing encounter with the Hornets, stating at his pre-match press conference on Friday: "Making an analysis of the game was nice, it was exciting. "I knew it before. I didn't have time to watch 90 minutes of all the games but earlier in the season I saw the game against Tottenham. It was already good. Set-pieces are good, which they used that day. 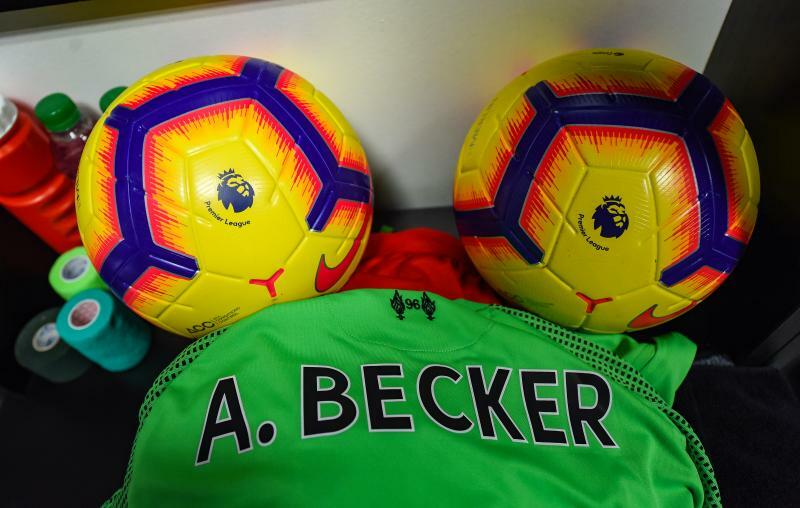 "That's a proper package and for sure the best Watford team since I came in. The combination with the manager is a really interesting project there." Well, you've waited long enough. 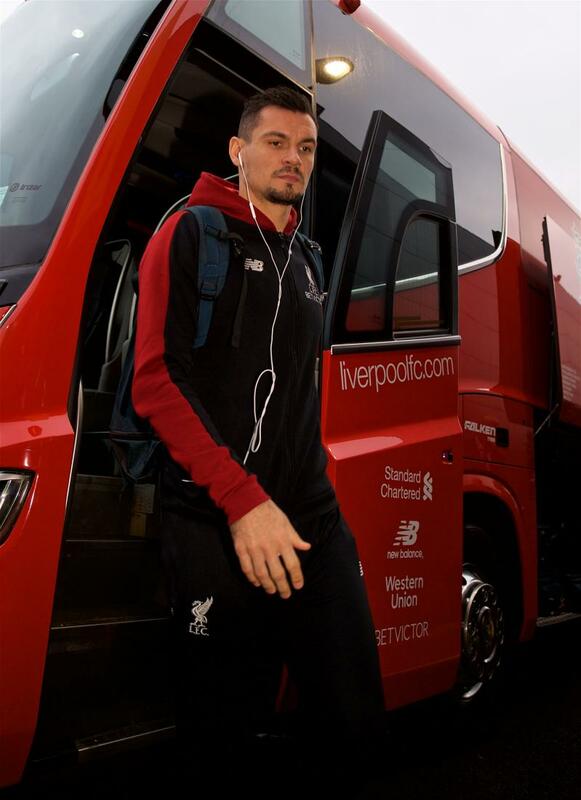 After 13 days without the Reds, they're back and an intense run of 11 games in the next 40 days begins with a trip to Watford this afternoon. 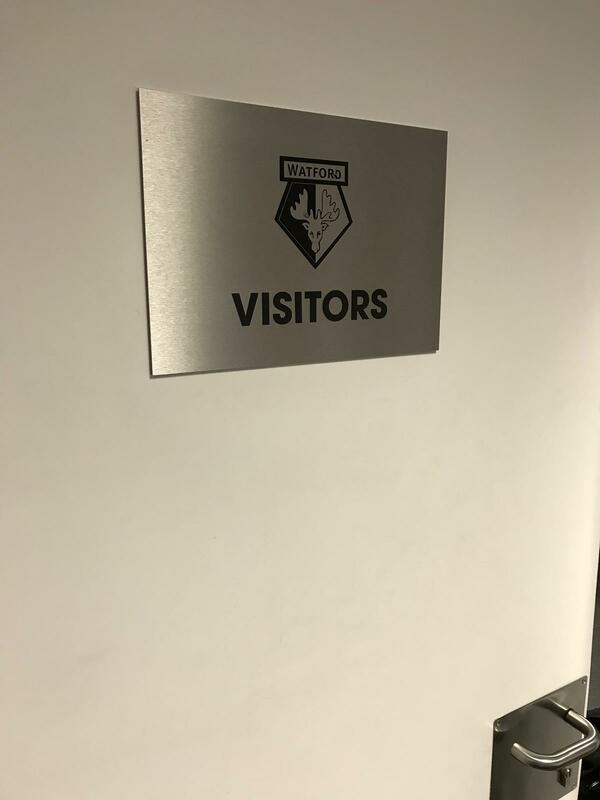 Stick with us for live updates throughout the day, including confirmed team news, match action and reaction from Vicarage Road.